When I drank alcohol every day, I didn’t really have to think about doing anything else. There was a clear timetable in place. Wake up, go to work Monday to Friday, buy alcohol, come home, drink, and sleep. On the weekends I would drink more, wake up with hangovers and deal with feeling mentally exhausted and depressed again. When I decided to stop drinking alcohol for good, I had to find activities to fill up my time, to occupy my monkey mind to avoid the pull of alcohol back into my life. 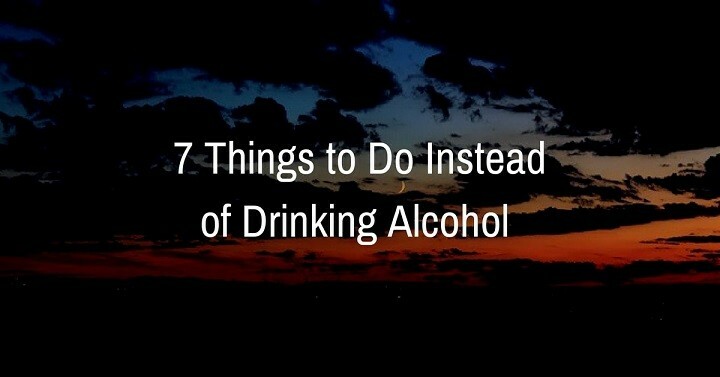 Here are some of the things to do instead of drinking alcohol that worked for me. Exercise is a powerful tool to fast track feeling better. It’s an activity that releases endorphins and is mood enhancing. It also changes your brain (1). This is one pretty established mechanism to feel better. The toughest thing about it is starting. The only way I have ever learned how to pick up a habit successfully is by starting with a small goal and allowing myself to grow from there. When I wanted to implement daily walking into my routine, I started with 10 minutes a day. I would come home, walk for 10 minutes and check the box on a habit calendar. Often, I would end up walking for an hour or more, but I set the bar low and it allowed me to grow from there. If my daily goal was to walk for an hour, I would never have done it. Starting small is key. I filled up a lot of my new time with walking and listening to recovery podcasts. High intensity interval training has been shown consistently to be mood uplifting (2). I only do this for 4 minutes, 3 times a week but it has had a significant effect on my life. 12 minutes a week is an extremely optimised anti-depressant. I also do weight training in a bare minimum way. I started this after having consolidated walking and high intensity cardio into my routine after several months. Protip: Listen to podcasts whilst walking or doing exercise. Learning or laughing are pretty strong mood influencers. Start with 10 minutes a day and allow yourself to do more from there when you feel like it. Don’t put too much pressure on yourself at the start of learning a new habit. Keep it basic and you will succeed. Russell Brand who is a pretty big voice in the recovery world, is a massive supporter of helping and supporting other people to change one’s own mental state and to aid recovery. This is also a widespread view in the recovery community. One method that I have utilised is to volunteer at a homeless shelter. I did feel better, it amplified my self esteem and I became stronger internally from doing it. Ultimately, the activity is self serving but it does serve to help others at the same time. There are many ways to volunteer, you don’t need to go to a homeless shelter. You can teach english to new immigrants or volunteer your time working for a non profit from home. Protip: It’s always better to volunteer in a group environment so that you can connect with other people, and make new friendships that don’t revolve around alcohol. I used to laugh at people that told me that they’d go to the movies by themselves – until i tried it. I absolutely love going to the films by myself now. No one gets to eat my popcorn and I get to choose where I sit. Provided it’s a good film, I feel afterwards as if my mind has been washed. I’ve never found meditation to be as effective as this. As weird as it sounds, by setting aside some time each week to thank people, it’s had a seriously positive effect on my mood generally. Many in the positive psychology community will suggest that gratitude is a powerful mood enhancer and that one should keep a gratitude journal. I’ve never found a journal to be effective. Instead I send emails from my phone and I thank people, friends, companies and famous people who I respect. I don’t need to get a response from them to feel the positive effects of this action. Protip: Do it when you’re commuting or when you’re waiting for something. It kills time and has positive effects. One of the more difficult things to re-establish is friendships with old friends who perhaps aren’t associated with a drinking lifestyle. I don’t like using the word “assets” in describing friendships but these type of friends really are because they are more likely to seek healthy (and non alcohol related) activities such as going to the films or being members of book clubs. Or things not associated with alcohol in any way. They can remind you that you don’t need to have alcohol or drugs to have a pleasurable time. Protip: It can be quite weird to suddenly reappear in old friends lives. Don’t be afraid to tell them the truth and to ask them for help. When people are asked to assist, my experience is that they become highly supportive and motivated to help you get back on track. One my favourite things to do now that I’ve been sober for some time is to calculate how much money I have saved by not drinking. If you’re in a state of recovery, you can start doing these calculations. You can begin to think about how you’re going to utilise these savings. You can now plan for the overseas holidays and the secure future. Something that is hard to do when you’re living from pay cheque to pay cheque and spending it all on alcohol and drugs. Protip: Try and save at least 20% of what you used to spend on alcohol and place that money into a high interest savings account. When you see it grow every month it will be a constant reminder that you’re doing good. It will also motivate you when you see the projected 10 year figure of not drinking. Think back when you were a child or teenager or the life before alcohol, what did you enjoy doing, what were your hobbies? I used to love playing football before alcohol swept up my life and I decided in my recovery that I would seek to play again provided I could find a team where the culture was right. I did this and I made many new healthy friendships. I also established myself with them as a non drinker which helped solidify my new internal identity as a non-drinker. Being supportive to others – One way to feel good is to show some support, or to help people that may be going through things you’ve gone through previously. Check out Reddit and the various subreddits around issues to do with recovery and addiction. No doubt you’ll be in a powerful vantage point to contribute and to help people feel better. There seems to be positive hormonal or chemical pay off when you help others which explains why you feel good afterwards. Protip: I like to browse Reddit’s alcohol subreddit whilst i’m commuting to work and contribute where I can. It allows me to feel good at the start of the day and this commonly sets the tone for it to continue for the rest of it. It’s also a nice feeling when people thank you. If you’ve had a successful experience with AA, why not attend a meeting? There is basically a meeting every day in nearly every part of the world. It’s important to remember to think one day at a time. Be in the present moment as much as you can be and ask yourself solid questions such as, “what can I do now, to get outside of my head and feel good?”. When I ask myself that, the answer is nearly always exercise and/or writing gratitude notes to friends and family. I hope that this article has given you some ideas on what you can do now that your life is free of drinking alcohol. If you’re not completely stopped, please seek guidance from medical professionals and start to foresee how your life will be better as someone who has quit drinking. I have more money, I travel more, I have better friendships and I’m a better person to my family. My life is truly better. If you’re thinking about rehab as an option to get well, please call the team at Refocus on (03) 9826 0949. They are happy to provide some information and guidance on the process of entering rehab.